Season the fish with 2 tablespoons of the olive oil, salt and pepper and place on a hot, clean grill. Cook, turning every 2 minutes until medium, about 8 to 10 minutes. Slice the tomatoes. Place them in a shallow bowl and season with salt and pepper. Drizzle with olive oil and vinegar and allow to sit for 5 minutes to allow the juice to make a vinaigrette in the bottom of the bowl. 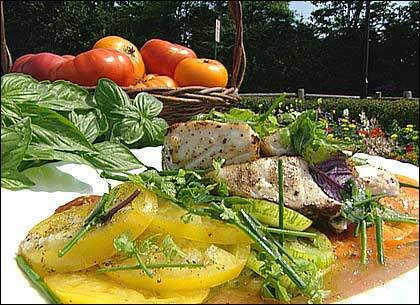 Arrange the tomatoes on a plate and place the cooked fish on top. Season the herb salad with salt, pepper and the juice from the tomatoes. Place the herbs on top of the fish and serve immediately! Chef Ryan Hardy notes: I like to keep the herbs in whole leaves so that when I bite down on any one in particular, I get an explosion of sorrel or mint or basil, but play with it and enjoy — it doesn't get any simpler than this. This segment appears in show #3018.